We introduce a mod based on the animated series Adventure Time. 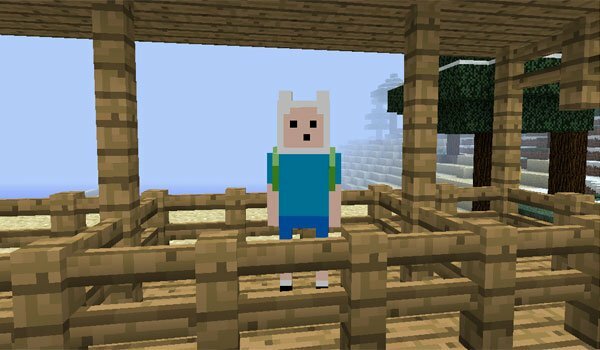 Adventure Time 1.12.2 is a mod that adds several elements based on the series. The characters that we find in this mod are: Finn, Jake, The Ice King, Gunter, Marceline and BMO. Each has its own characteristics and drop various elements when they die. With these objects obtained, we can create the sword of Finn or Marceline’s ax, in addition “Blood Demon Sword” and “Ice Dagger” can be crafted. Beside from these objects, we can also make some of the food that can be eaten in the series. In this update of the mod, it adds a new dimension, which you can access the portal by creating “Portal to the land of OO” although it will drive you to the sweet forest, where you will find the tree house of Finn and Jake and also there will be another boss. How to install Adventure Time Mod for Minecraft 1.12.2? Adventure Time in Minecraft version!